Completed 2000, textured acrylic with moondust on aircraft plywood, 35" x 50"
"Too bad I don't have my skis". "Shhh...Shhh...Shhh...Whoo!... Can't keep my edges...Shhhh...Shhhoomp...Little hard to get a good hip rotation". It was fun to watch him on their downlink television because Jack used all the best techniques. He unloaded his boots and moved his body as a veteran skier would, but he didn't seem to slide across the surface much on his rubber-soled moon boots. 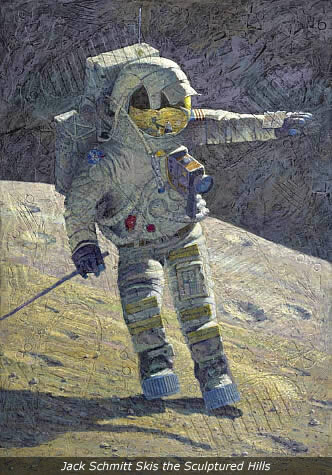 I asked him about this when I was painting this motif and he said, "Future moon skiers would be wise to strap some teflon skis over their moon boots". Harrison "Jack" Schmitt was often affectionately referred to as "Dr. Rock" by his Apollo 17 crewmates Gene Cernan, and Ron Evans. Dr. Rock was a highly skilled and dedicated professional geologist with a doctorate from Harvard. NASA sent him to Air Force flight training and he became an excellent pilot. All the rest of us who walked on the moon were professional test pilots that NASA trained to be geologists. In my opinion Jack was a great astronaut. His superior performance as the lunar module pilot of Apollo 17 may have proven that it is just as effective to make a competent pilot out of a skilled geologist as to train a skilled pilot to become a competent geologist.